Natusch, T/A Sub Lieutenant G.K., D.S.C. 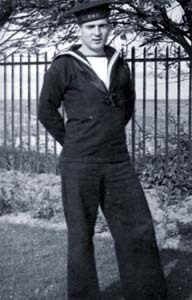 Temporary Acting Sub Lieutenant Guy Natusch joined the New Zealand division of the Royal Navy as part of Scheme B in 1942. With 29 other Scheme B recruits he sailed for Britain via Panama onboard the New Zealand Shipping Company vessel RIMUTAKA. Natusch’s basic training at HMS GANGES was followed by sea time onboard the destroyer HMS TARTAR, a fleet destroyer. While onboard he saw action in the Mediterranean while the ship was on convoy duty as part of Operation Pedestal, during which he saw a number of ships sunk including the aircraft carrier HMS EAGLE and the cruiser HMS MANCHESTER. An attempt to tow the destroyer HMS FORESIGHT back to port by HMS TARTAR following this battle, was unsuccessful and that vessel was duly sunk. HMS TARTAR continued to be employed on convoy duty, notably PQ17 and PQ18 in the Arctic Circle. Having completed his obligatory six months sea time, Natusch was sent to the training establishment HMS KING ALFRED in order to complete his officer training. Upon being commissioned he volunteered for Coastal Forces, specifically duty onboard motor torpedo boats. Natusch was duly appointed Third Officer to the 21st Flotilla under the leadership of the legendary Peter Dickens and his division leader, New Zealander, Jim McDonald. Based at HMS BEEHIVE in Felixstowe the 21st was deployed in the North Sea and English Channel attacking E-boats and enemy convoys. In addition Natusch was leader – First Lieutenant – of the commissioning parties for MTB’s 355 and 454. Having finally got his own boat, Natusch and the crew of 454 became part of the 35th Flotilla in the lead up to D Day. During this build-up to “crunch time” 454 was involved in a significant engagement in which one of the gunners had his leg shot off at the knee. The man subsequently died, however, to his complete surprise, Natusch himself was awarded a D.S.C. for his role in this action. During D Day itself, 454 in conjunction with the support ship – the frigate HMS STAYNER, was involved in the protection of the western flank of the armada, from E-boat attack. Post D Day Natusch had three months leave owing which he elected to take in New Zealand. While home Germany and her European allies were defeated, negating the necessity for him to return to England so he worked out the year at the family architectural practise before returning to complete his architectural degree at Auckland University. Guy Natusch was discharged, Temporary Acting Sub Lieutenant in June 1945.